Boxes of 100 best quality needles from Japan will last through hundreds of sewing projects! 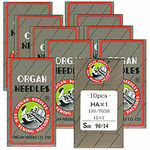 Look for Organ specialty needles for MACHINE EMBROIDERY and SERGERS in search box above. Friendly sales representative, quick shipment. Very satisfied. As always, a great website and a pleasure to deal with. Allbrands has always had what I wanted at a great price, fast shipping, and friendly service. Thanks! I have ordered for AllBrands several times and they have handled it in the speediest way possible thank you for being such a great company . I love the organ needles..I have a serger, and 3 sewing machines that all use these and they are wonderful. I will always order from you folks. Thank you for an excellent product at a good price! I'll be doing business with you again. Thank you. I never thought I would be able to find needles for my Feiyu sewing machine, especially not from a company in the USA. Thanks so much for everything and I will most definitely be a repeat customer!!! Great company, fast shipping, great prices. Your committment to excellent customer satisfaction is priceless! We will be return shoppers. I am pleased with the service your company gives. I have ordered from your company before and have enjoyed great customer service as well as the ability to find and buy items not available at similar stores. Thanks for your continued selection and service. I have never had service so good. Thank you very much. I love dealing with your company. Easy, effincent, exacting. Love it! I just want to say how pleased I am with your service. I am so impressed with your fast shipping and you're cheaper than other suppliers on line. Thanks so much!!! Great site and Great Prices!!! Very happy with my purchase from you. Received my sewing machine needles quickly, and they were a type I can't get locally. Appreciated the prompt service and breadth of your inventory. I'll be buying my regular Schmetz needles for my other machines from you too. As an added bonus, the needles I ordered were from Japan, and the box was padded inside with a piece of Japanese newspaper with a wonderful drawing featured in the article. I have it hanging over my sewing table for inspiration. Thank you for the little serendipity. I am delighted and will be ordering again and again! The shipping was SO fast, the email to advise me that the needles shipped arrived 3 hours after the mail left the needles in my box. WOW...shipping that is faster than the speed of cyberspace mail! Thank You for another most wonderful shopping experience! A quality product and excellent packaging. I found the needles to be in fine condition, although I haven't used one yet, I will be soon. I will be also returning to this site to order more sizes. I however wasn't sure if I could order a smaller number of needles at a time (I ordered 100 ea size). I won't be needing this size for quite some time as I've slowed down on my sewing in these past few years. Thanks for providing a good quality needle at what I consider to be reasonable prices.